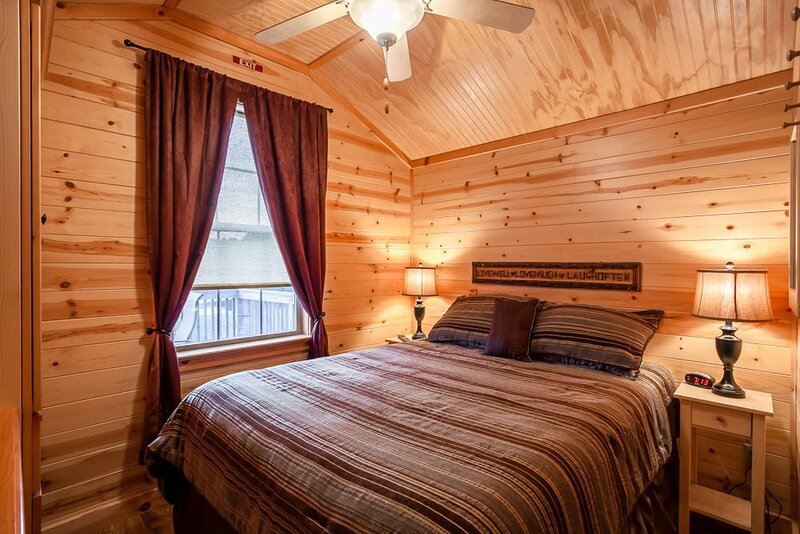 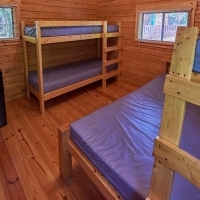 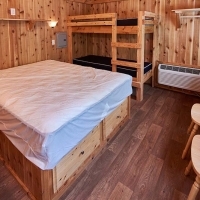 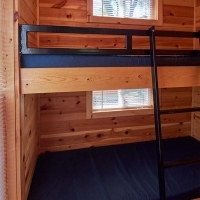 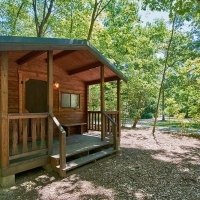 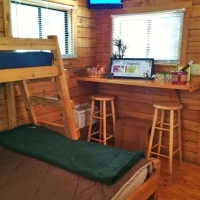 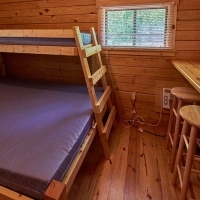 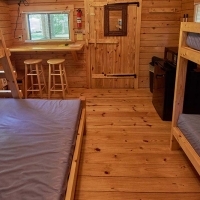 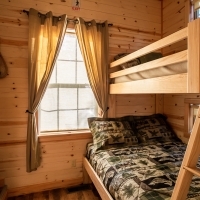 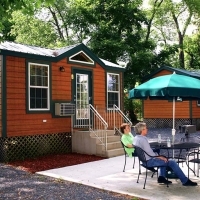 Our Cabins are large one room cabins which sleep up to five, including a queen size bed. 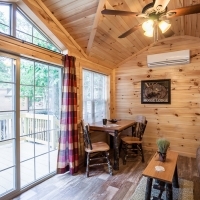 Each Cabin includes a microwave, small refrigerator, breakfast bar and TV’s with cable hookup, as well as air conditioning and heat. 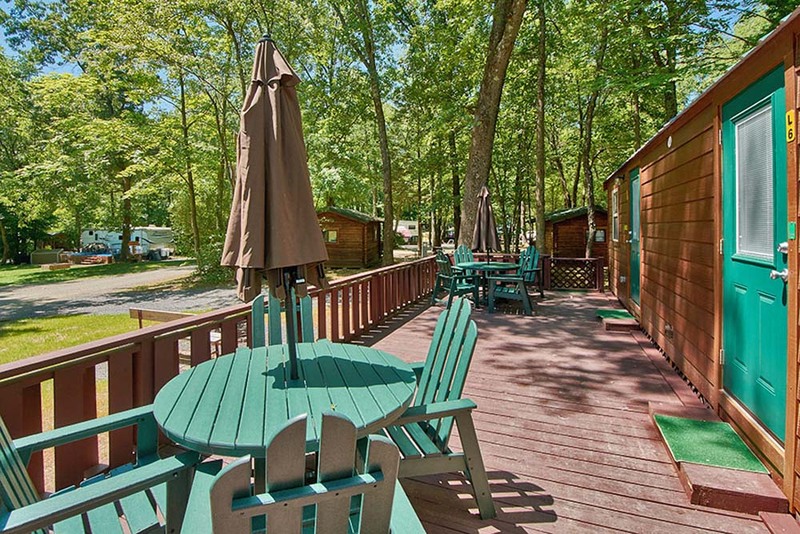 There is a charcoal grill for cooking outside and a water spigot. 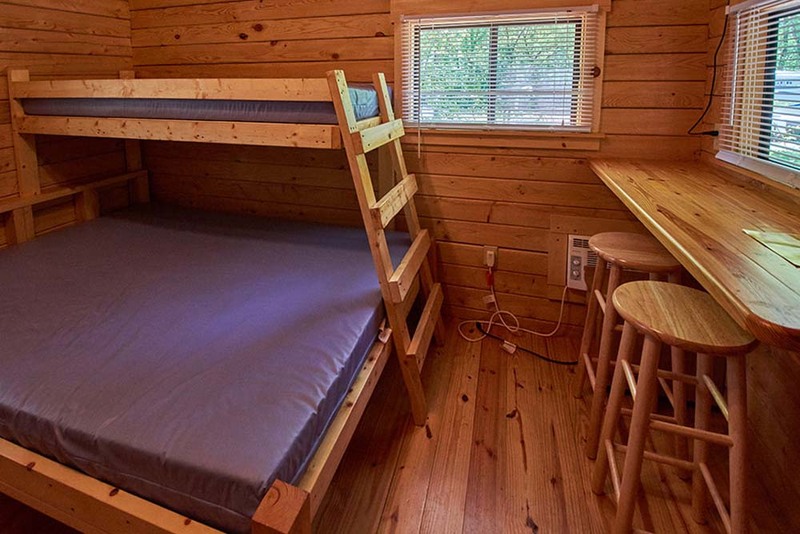 Please bring your own linens and cooking items. 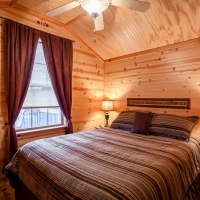 The Deluxe Cabins have a full bath and sleep four, including a queen size bed. 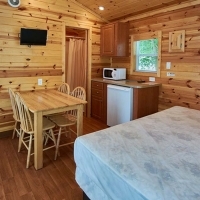 Deluxe Cabins include a kitchen with a microwave, refrigerator, a nice table that seats four, as well as a Flat Screen TV with Cable TV hookup. 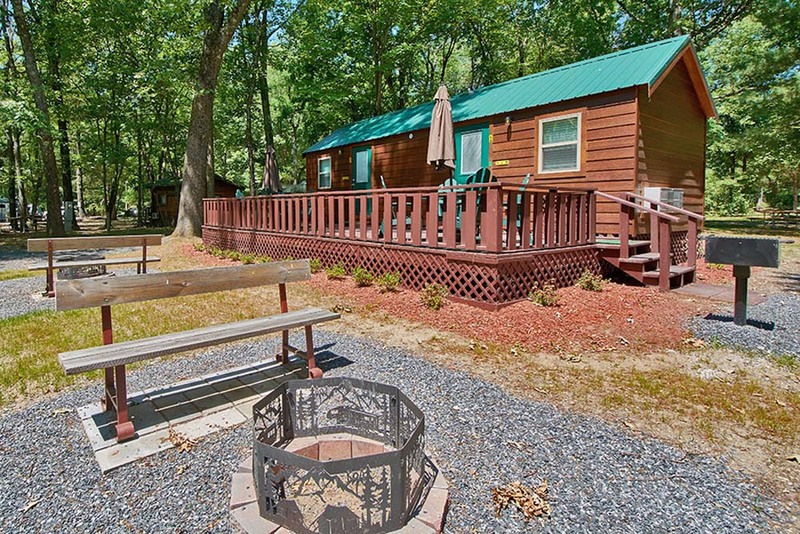 Cooking is done outside on a charcoal grill. 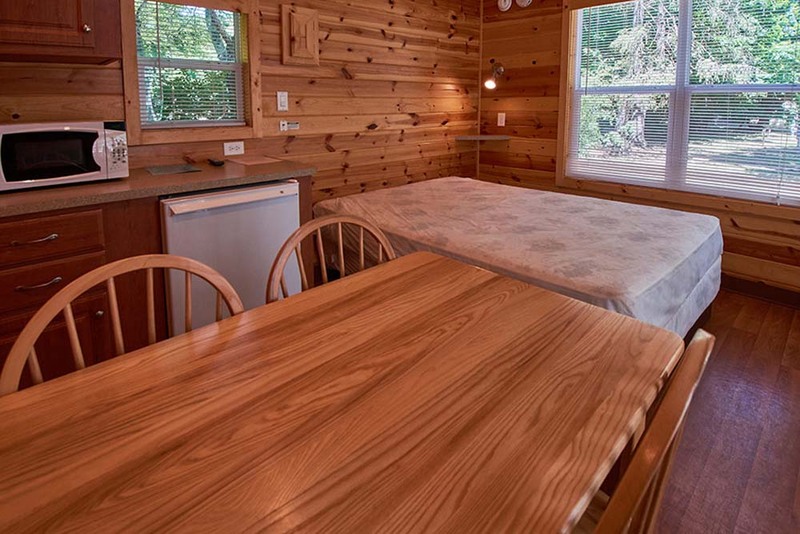 Please bring your own linens and cooking items. 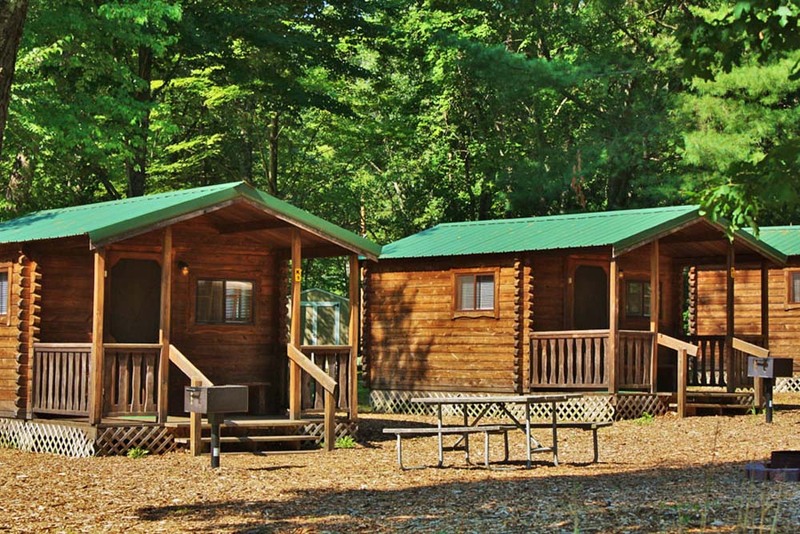 These units are heated and air conditioned. 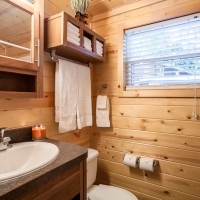 The Duplex Studio Cabins have a full bath and sleeps four, including a queen size bed. 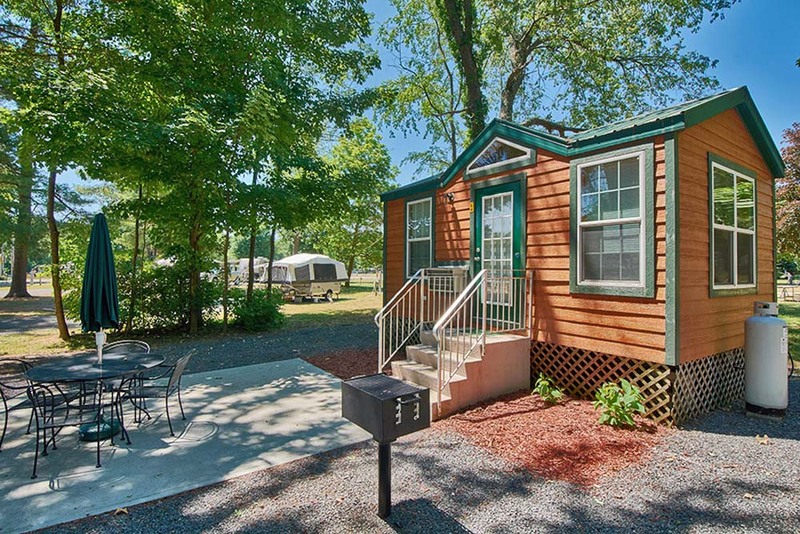 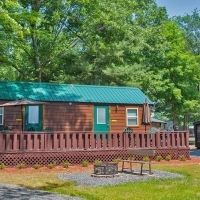 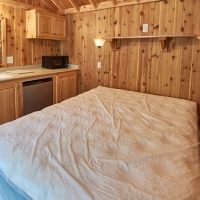 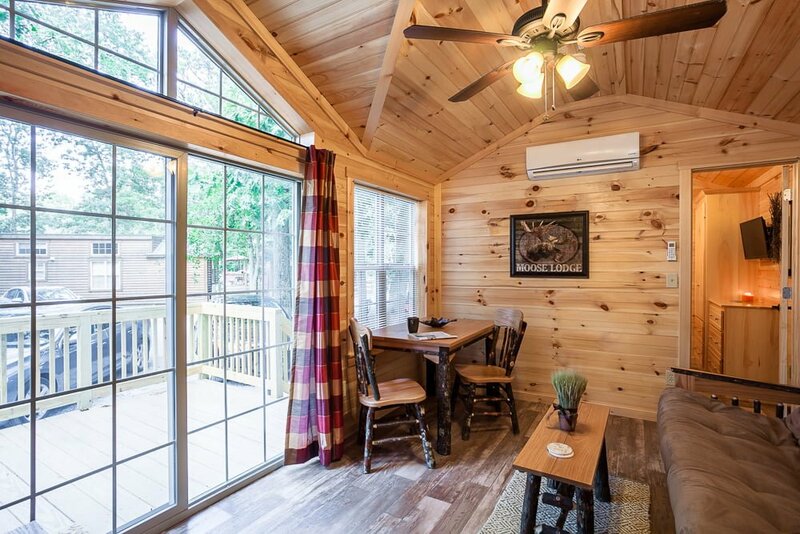 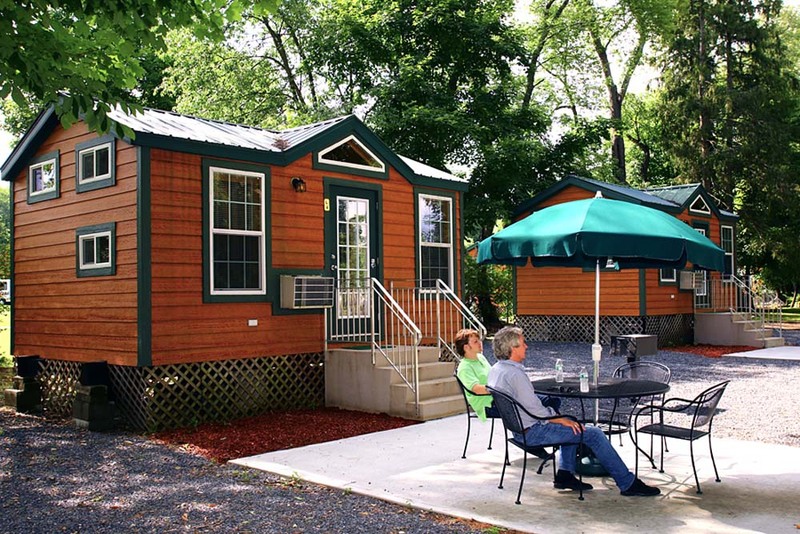 Duplex Studio Cabins include a kitchen with a microwave, refrigerator, a nice table that seats four, as well as a Flat Screen TV with Cable TV hookup. 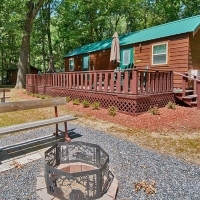 Cooking is done outside on a charcoal grill. 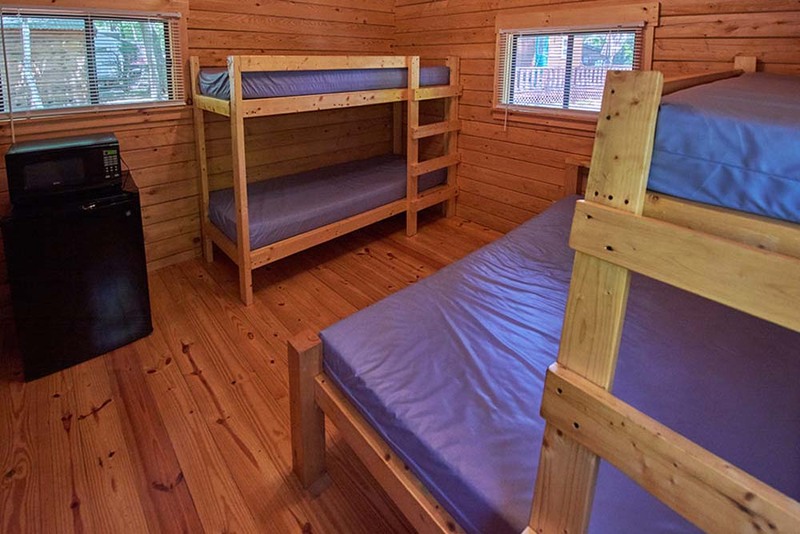 Please bring your own linens and cooking items. 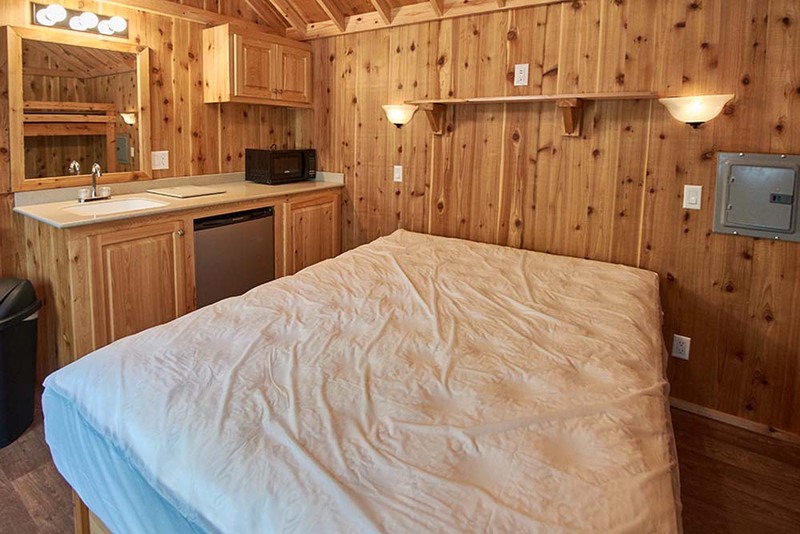 The Duplex Studio Cabin has a shared common wall. 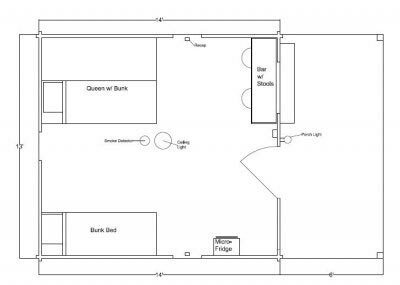 Floor Plan is one large room with private bath on each side. 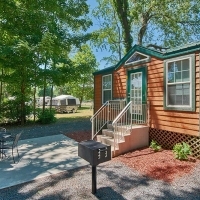 This unit is ideal for family reunions. 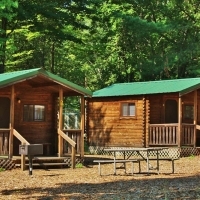 These units are heated and air conditioned. 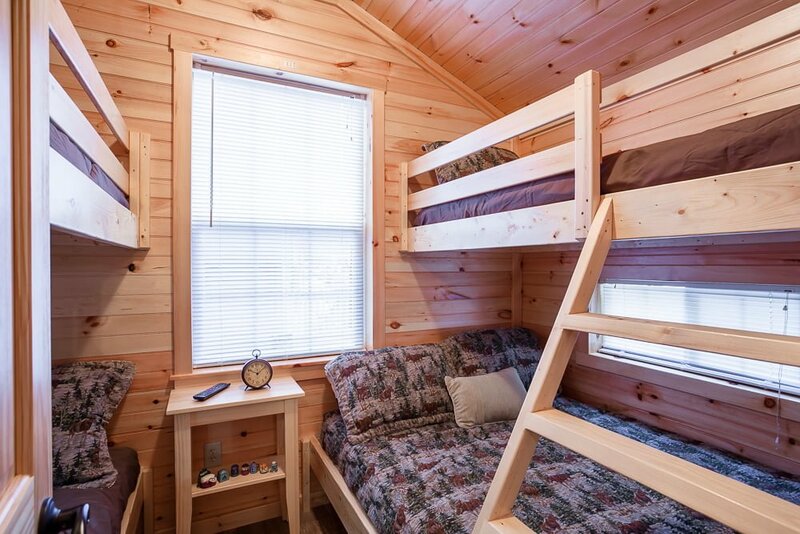 Not Exactly roughing it! 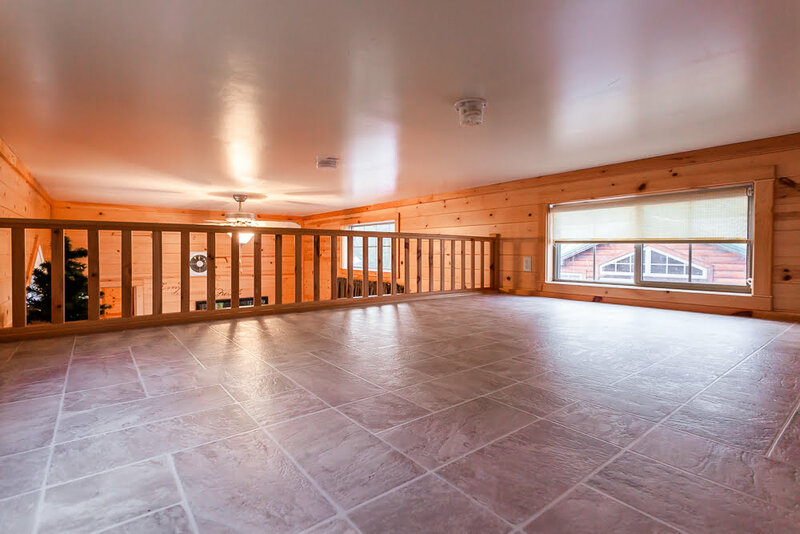 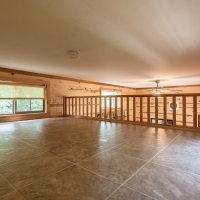 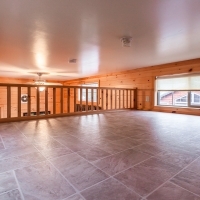 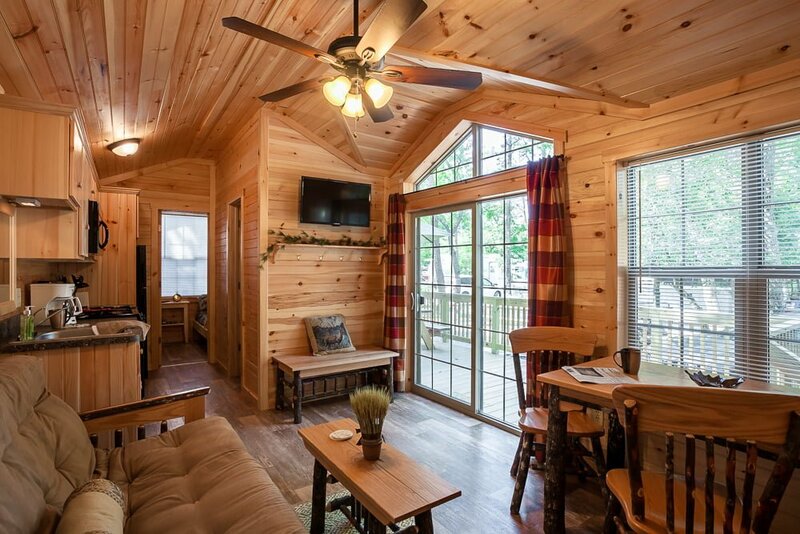 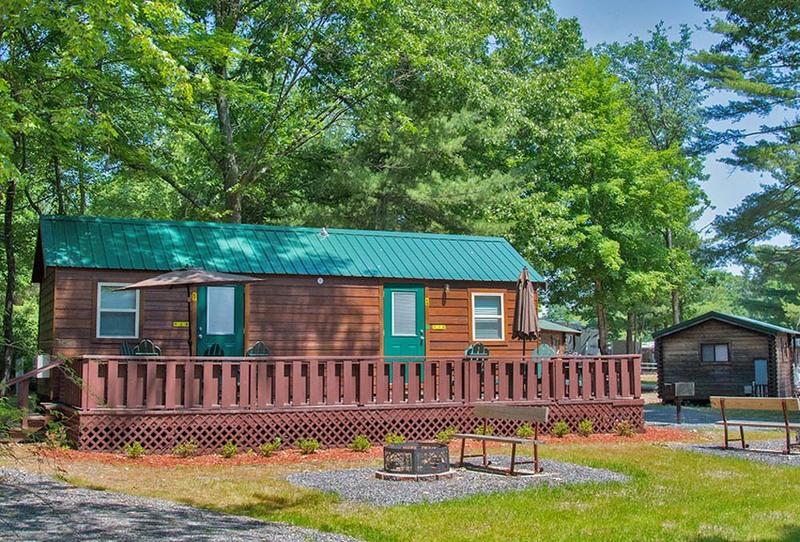 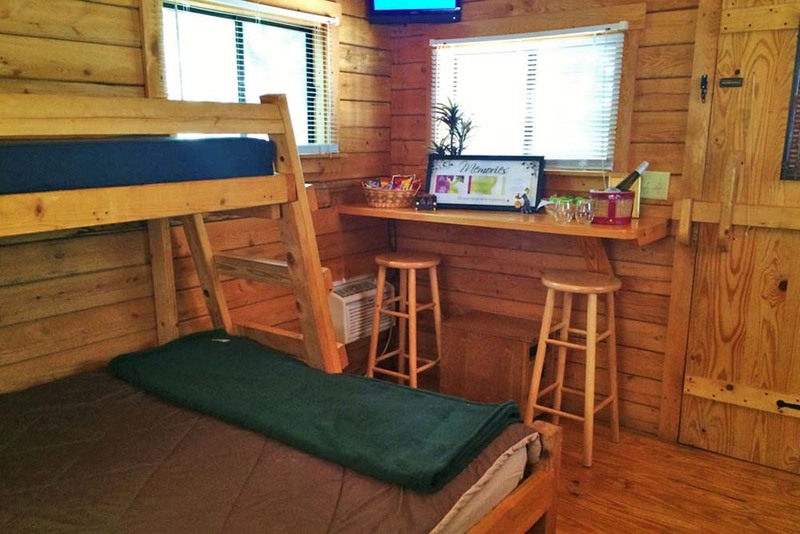 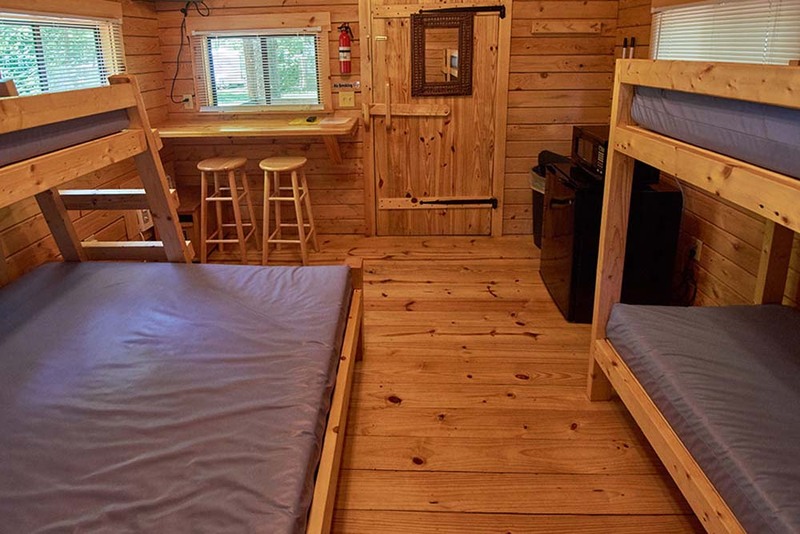 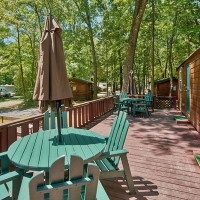 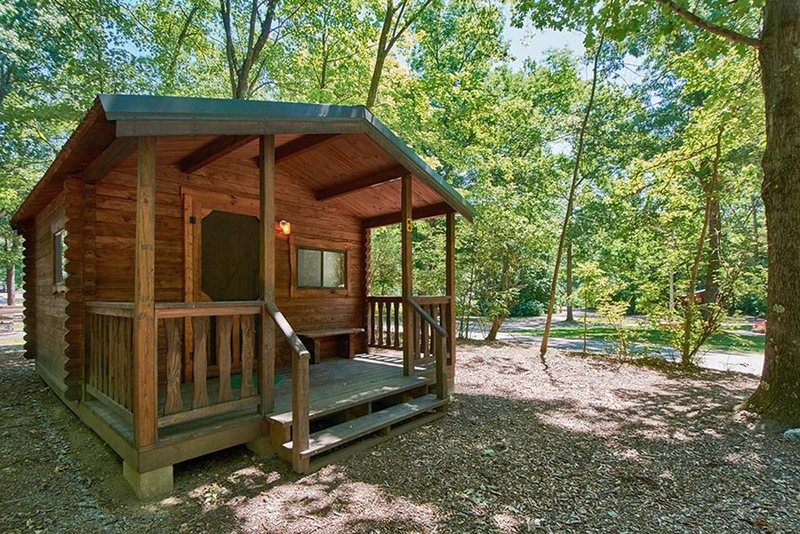 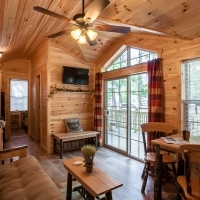 These amazing cabins are furnished with all of the comforts of home! 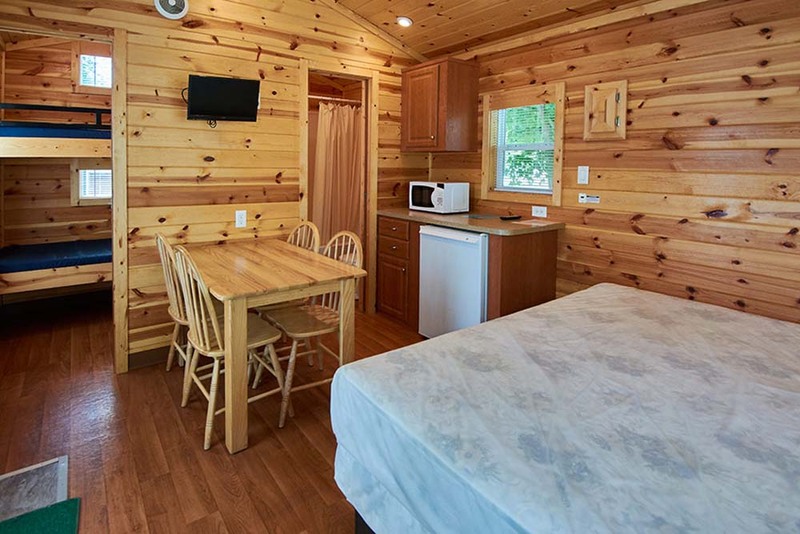 The kitchen is equipped with full size range/oven, refrigerator, microwave, coffee maker, toaster, mixer, dishes, pots and pans, silverware, cooking utensils and loads of cabinet and counter space. 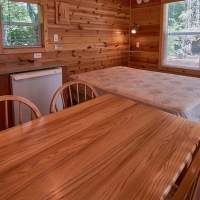 The spacious Living/Dining includes a futon sleeper/sofa, a dinette , Flat Screen TV with cable. 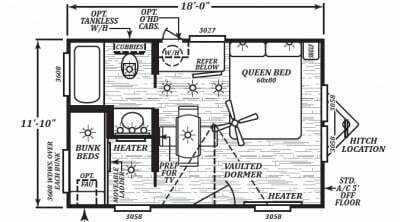 The master bedroom has a queen size bed, closet, dresser and Flat Screen TV. 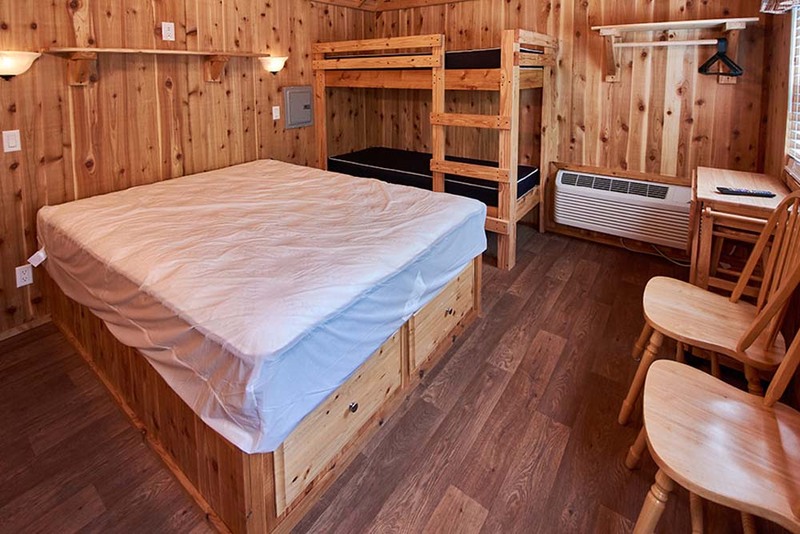 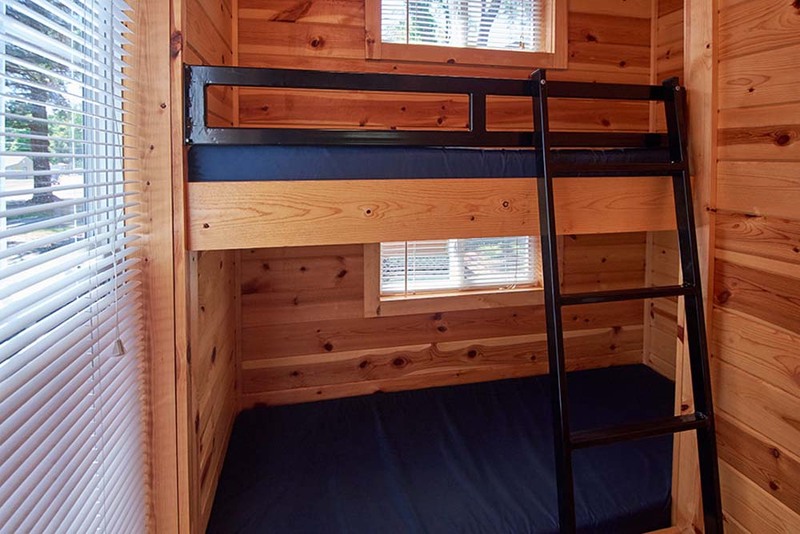 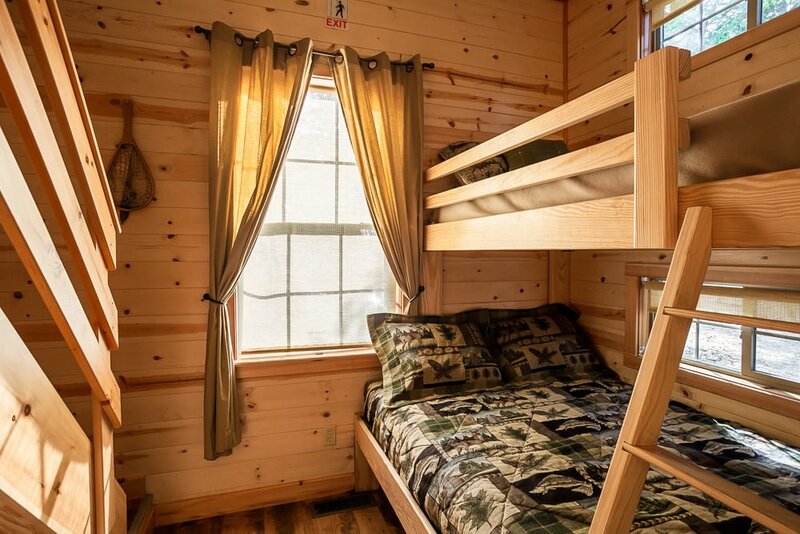 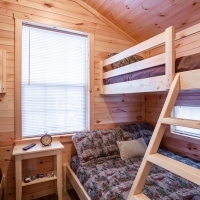 The 2nd bedroom in the Premiere Cabin has a full/twin bunk, and another set of twin bunks and the Premiere Loft has a full/twin bunk, and a loft that can sleep 2. 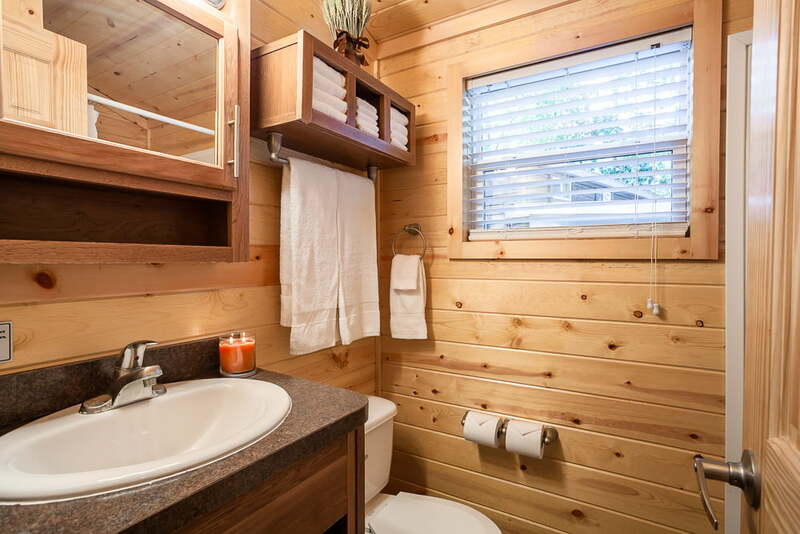 The bathroom has a shower stall, vanity sink, medicine chest, commode and linen closet. 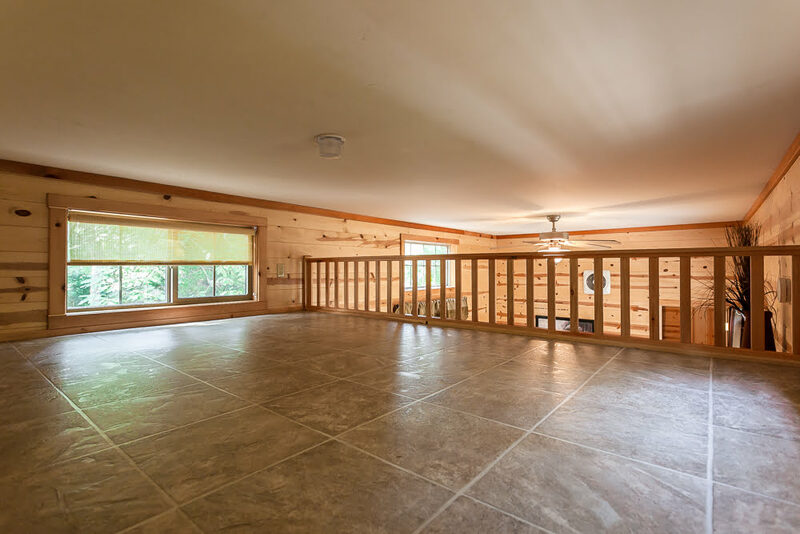 The French doors off of the living area lead you directly onto a spacious deck for relaxing and taking in the scenery.